Transfer of assets to the community is an expression we have encountered a few times this past week – sounds fairly inconsequential until you begin to unravel what this might mean, and who within the community will be the beneficiaries. 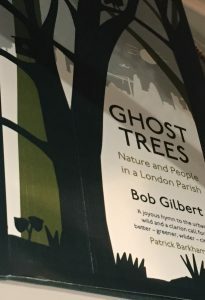 We listened to Bob Gilbert, author of “Ghost Trees” and former Islington Borough Parks officer talk about the loss of grander canopy trees and the sell off of playing fields, and how each are diminishing the biodiversity of London and other towns and cities. However he kept his ire for the movement towards redefining public parks as commercial commodities, such that local authorities now through ‘budget savings’ insist that their parks make revenue. Some authorities are selling sections of public parks, others leasing them for festivals and the like, which take space away from the public, damage the park, and often leave it in a state that it can not recover from. “We owe a great debt to the generations before us who fought to create public parks and protect them.” Bob also warned of how new pseudo public spaces were being created in new developments that offered little to wildlife. We are replacing grander, architectural street trees which have been a symbol of civic pride and visual attractiveness, with smaller, shorter living, less litigious, tree species which will never replace the micro-habitats for fauna and flora. 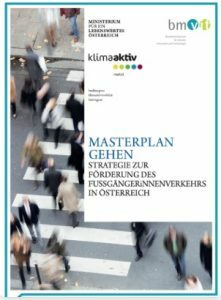 We are facing a triple whammy of air quality, climate change and loss of bio-diversity while at the same time, cutting down and not replacing one of the most effective tools to combat these issues – larger, broad-leafed canopy trees. So what has all this got to do with walking you may ask? For our personal health and for the health of the public at large, we need to coexist with other species – and research continues to show us how beneficial green spaces, including woodland and street trees are to our mental and physical health. We also want to encourage people to rediscover and value what is on their doorsteps, encountering people and nature on foot within walking distance of where they live. We have been running walkshop events that bring people to notice what is around them through different medium, whether it is following lost rivers, seeing our surroundings framed by street trees, or being mindful in green spaces. We want to create opportunities for people to celebrate and value what we have in terms of green space within walking distance of where we live and work and to recognise and improve it so it can benefit all of us. Our last week of listening to the archive of Talking Walking interviews has also highlighted aspects of how some places are contested and others are open for us to explore at our leisure. David Watson undertook what became a nine year pilgrimage to his childhood home, through Sydney suburbia, uncovering stories of places that he had heard of but never been to, and encountering almost deserted streets. Few people, but also more terrifyingly lacking in nature or indigenous species. Listen to David here. Brad Garrett, now also in Australia, but when interviewed was a geography lecturer at the University of Southampton, has spent a lot of his spare time, venturing where most of us would not dare to go. 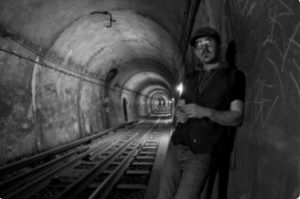 He has sought out public assets which are areas where people are forbidden – call it trespassing or simply ‘space hacking’ – he has been infiltrating hidden spaces in our cities. Listen to Brad here. Idit Nathan was a child that played in the street either side of the Six Day War, and during the bombardment, played in the shelters too. She is often seeking ways to ‘play the city’ inviting us to “disrupt our familiarity” by throwing a dice of different instructions. Listen to Idit here. to work or walk hurriedly. from the Dictionary of Newfoundland English (University of Toronto Press, 1982).